Four years before the defeat of Germany in World War Two, the Canadian Government joined with the American-based Bethlehem Steel Corporation to finally take an interest in the mineral riches of the Marmora region in Hastings County. Due to the large amount of tonnage lost at sea through German submarines and the fact that iron was necessary for the manufacture of war weapons, they joined forces in an endeavour to combine and upgrade technical knowledge and finance the search for iron deposits. The politicians of that time expressed the fervent hope of providing employment for the men and women of the twentieth century and beyond, as well as helping to shorten the war. Bethlehem Steel purchased nineteen hundred acres in the Marmora area, including the farms of Roger and Salmer, but was given mineral rights for only a six-month period. News reporters pushed and probed for more information but the huge steel company managed to keep their true progress a secret from the public. Exaggerated rumours ran rampant throughout the region when newsmen were sent back to their editors empty- handed. Once again the village of Marmora was riding the crest of anticipation. Only one short public statement was published by Bethlehem Steel in their annual report. "Important reserves of iron deposits have been found in the Marmora area". Other mining companies, on reading this report, applied for rights to the surrounding district but without success. Another six years passed before the front page of the Marmora Herald proclaimed in large headlines, "Mine to become reality" . Experimental drilling was ordered and expert geological reports were requested. The astounding results of the skilled exploration group revealed the presence of a huge ore body resting about a mile east of the village of Marmora. The little community hit the headlines across the country and south of the border. The steel company's experts announced a minimum measurement of two thousand feet in length and four hundred feet in width. This tremendous cache of ore was lying under a deep overlay cap of limestone that was estimated to be about one hundred feet thick. It graded at an average of thirty-seven per cent pure iron. Folks flocked to the town, and almost overnight, it seemed, the hotel was bulging with prospectors, geologists, company men, government representatives and fellows just looking for work. Oldtimers shook their heads and muttered their disbelief. They couldn't believe it was all happening again. Nevertheless, excitement was the undercurrent of the day. Engineers reached the conclusion that an open pit would be far less dangerous and cheaper to maintain than underground shafts which would have to be constantly monitored in the interest of safety. Word spread rapidly. Newspaper and radio advertising saturated the media pleading for skilled miners, experienced dynamiters, drillers, labourers and trained office staff. Gail (Young) Gordanier sent this photo, adding"This photo is Frank Young (my dad) with a team of horses plowing the fields where the Mine pit was dug years later. He worked for the farmer who owned the land before the Mine existed. My dad worked at the Mine right up until the very last day of its closing." It was necessary for the dock to stretch twelve hundred feet into deep water so it could accommodate the largest lake vessels of the day. The dock also had to be strong enough to hold ore-storage bins with a capacity for many tons of weight when pellet-loaded rail cars disgorged their precious burden. After the dock was completed carriers of every description were crossing Lake Ontario on regular runs. They docked at Lackawanna, New York. unloaded the ore and returned to Picton to load again. Leslie Miscampbell Frost, PC CC QC (September 20, 1895 – May 4, 1973) was a politician who served as the16th Premier from May 4, 1949 to November 8, 1961. Due to his lengthy tenure, he gained the nickname "Old Man Ontario"; he was also known as "the Silver Fox". The task that faced them was enough to stagger the imagination. More than 120 feet of limestonerock overlayhad to be removed, creating a hole a half mile long and a quarter of a mile wide. 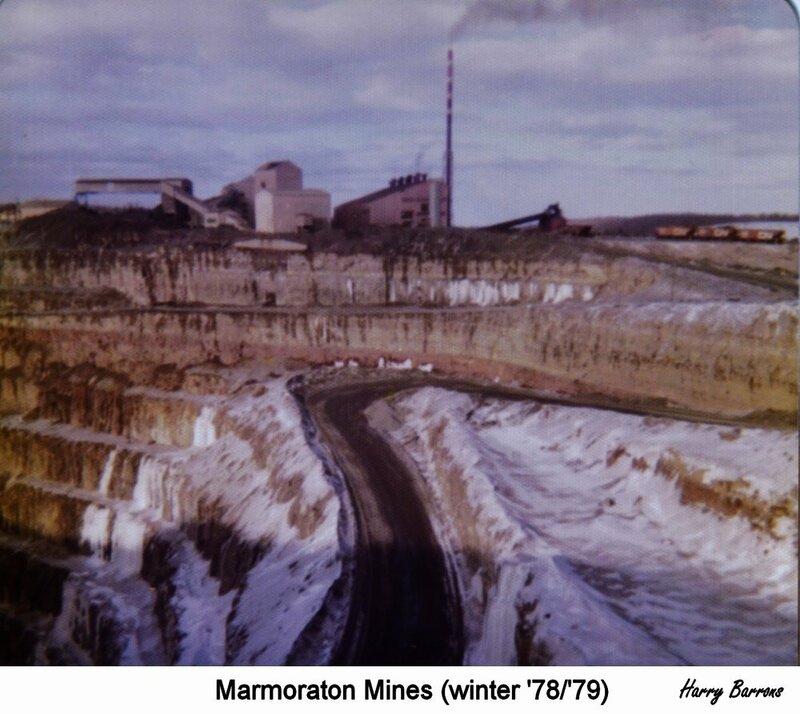 On the east side of what was to become known as the Marmoraton Mine, a new plant was to be constructed for the purpose of converting the raw ore into small pellets of pure iron. It was thought they would be easier to handle being lighter in weight, and it would speed the loading process. Tracks were laid to the mine site from where ore was to be carried to the larger railroads. By 1951 many rail lines were in full operation in Hastings County and rail-freight was no longer a serious problem. The first pit-cut was begun in 1951. The following year Leslie Frost, the premier of Ontario, attended the official opening of the mine. He raised a red flag to signal the lighting of five thousand pounds of dynamite and the detonation was audible for thirty miles in every direction. When the dense cloud of smoke lifted, there remained just a huge pile of worthless rubble, boulders and rocks. 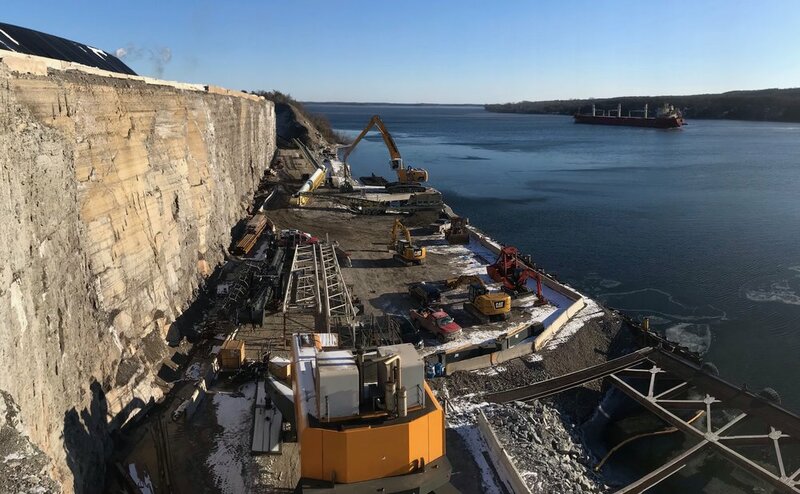 In the second year of operation, Directors of the steel company, in conjunction with the Canadian Government, decided to build a special dock at Picton Bay, an arm of the Bay of Quinte on Lake Ontario. Picton was chosen because of its strategic location and close proximity to a readily available employment pool from Prince Edward County. Pamela Armstrong: Most days at 3p.m. they would blast, we lived fairly close (the last house going out hwy 7 east) and it would shake the walls..One day it broke a mirror on the wall. Dennis Logan :We could hear the blast sirens all the way to Shanick. Time passed swiftly, good profits were made and men enjoyed steady work. The Peterborough Examiner published the following inch-high headline; "First iron ore wealth for the past eighty years poured into the holds of ore ships at the Picton Loading Dock". The now defunct Toronto Telegram reported on March 26, 1953, "After seven years and an expenditure of fifteen million, iron ore is starting to trickle out of a huge open pit in the heartland of Ontario about a hundred miles north-east of Toronto". Bethlehem Steel Corporation was given the highly coveted mineral-rights extension from the government and in less than three years was running at full capacity. At the peak of production the Marmoraton Mine yielded half a million tons of rich pelletized iron and the final depth of the open pit reached seven hundred and fifty feet. 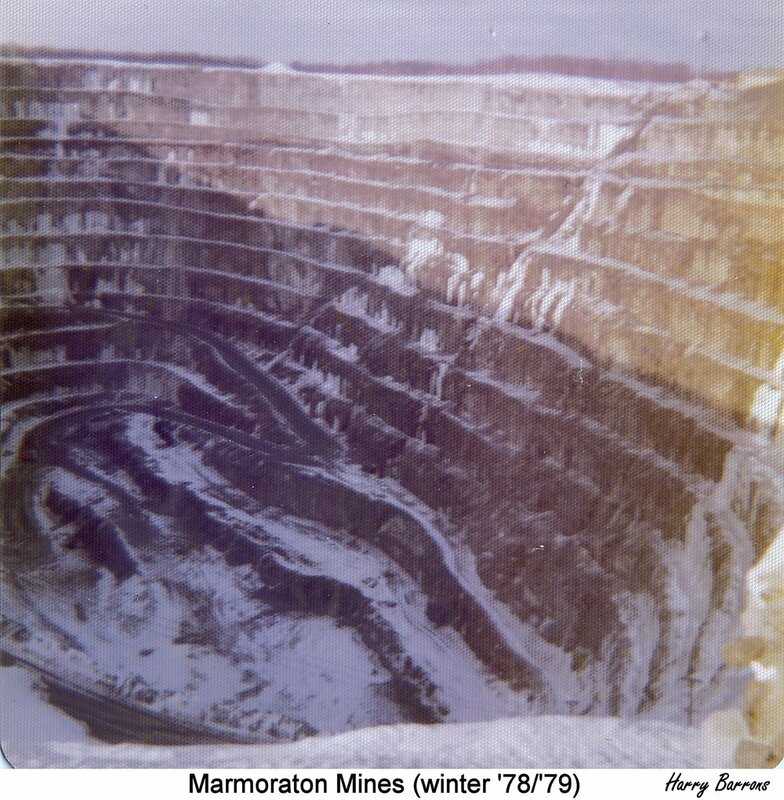 Talk around Marmora was that the new mine would continue to operate for a minimum of fifty years and probably longer. There would be no shut-down this time. Everyone was enthusiastic and optimistic. On June 29, 1973 the Belleville Intelligencer published an article stating the Marmoraton is "The biggest hole in Hastings County and also the richest. The same article declared iron mineral to be "the staple of Canada's economy". In the late nineteen seventies, the pace slowed to a tiny trickle. The cause was a combination of a sluggish economy, runaway inflation and a precipitous slide in world demand for steel. In addition, the law required that an open pit in Ontario could not be dug deeper than five hundred feet without cutting in and shoring up. Bethlehem Steel decided this would be too dangerous and expensive. In an effort to protect jobs the Government extended the allowable depth to seven hundred and fifty feet. Altogether the mine remained operational for a period of twenty-seven years; a long time when judged by past performances. In March of 1978 closure was finalized taking with it untold jobs both in the mine and on the Picton loading dock. More than half the carrier ships were removed from service immediately. Three hundred jobs with a two million dollar payroll disappeared and twenty-two years of Provincial Grants also came to an abrupt halt. Below: The huge 150 ton "Terex" truck was built by the General Motor Company. In 1970, it was shipped in several pieces by rail to the Marmoraton Iron Ore Mine where it was welded together for trial evaluations. It was never used at the Marmoraton Mine. Bob Caverly's Historical video................................and the Nashville version! Thanks, Bob! To see the gallery of the "Men of Steel", click here! A year or so later Alan Lawrence, the Minister of Mines, was quoted as saying, "All in all it's been a good decade for the Ontario mining industry which represents twenty-eight point three percent of the production of all of Canada. Mineral output jumped in total value to set a record high of over one billion dollars. There is no reason to believe the years to come won't be even better". This happy outlook lifted the spirits of Marmora, but only for a short time. It soon became obvious that the situation would not improve for many years into the future, if ever. When word of the closing reached the townspeople everyone was stunned, to say the least. Through three generations they had felt the sting of depression, the pleasures of affluence and the effects of inflation, in rapid succession over and over again. This time they resolved not to rely on, look forward to, or even hope for a revival of the iron industry. Today they seek other means of keeping their community solvent. Bethlehem Steel Corporation retained ownership of the pit, the mounds of slag rock and a few acres of land. What a gloomy ending for the once mighty Marmoraton. The Ontario Ministry of Natural Resources announced, "Of the six billion tons of iron ore reserves in Ontario, only a small portion is of a quality high enough to permit direct shipping to the smelters. There has been a rapid depletion of direct shipping of ores throughout the world". In 1968 Canadian iron ore production amounted to a total output of forty-nine point three million tons. The monetary value reached an all time high of five hundred and fifty million dollars. Another record was set in the same year when Canada was found to be the third largest producer in the western world. The Armbro Rock Crushing Company had bought the by-product rights from Bethlehem Steel in 1955 and worked at the site until the Fall of 1983. The big steel corporation was more than happy to find a place and purpose for the ore trap-rock and residue. Armbro dumped the trap-rock into huge crushers that ground it into a fine gravel-like product. This was transported across the continent from coast to coast. It was in some ways, superior to gravel because it had an uncanny ability to harden into a cement-like type of blacktop without further processing or additional material. On parts of the British Columbia section of the Trans-Canada Highway, the trap-rock was mixed into the last inch or two of asphalt giving the assurance of a hard and lasting road surface. Five years after the Marmoraton closed, the Armbro Company suddenly and without warning folded. They offered to sell their holdings on the open market, repeating the pattern of high unemployment for the town of Marmora. Click here for the report of T.N.T. - a citizen's group to halt Toronto's plan to convert Marmoraton Mine into a landfill site. Meanwhile, a company by the name of Canada Talc, operating the Henderson and Conley talc mines in Madoc Township, Hastings County, had been eying the vacant plant buildings at the Marmoraton site for some years. Realizing that these structures could be easily and quickly converted into offices, storage space and milling facilities at very little expense, an" Offer to Purchase" was presented to Bethlehem Steel. Talc had been discovered back in 1880 on the Henderson farm and fifteen years later a mine was opened by the New York-based firm of A.H. Ribbins Company. In 1918 the talc mine and surrounding property was acquired by the George Gillespie Company of Madoc Village. One of the Gillespie subsidiaries, Henderson Mines Limited, operated the mine until 1937, when Canada Talc took over. Upon acceptance of their offer to buy a portion of the Marmoraton holdings, Canada Talc renovated the buildings and moved their head office from the Village of Madoc to the Marmoraton site, while at the same time taking possession of an additional two hundred acres south of of Highway number seven. Bethlehem Steel Corporation retained ownership of the remaining seventeen hundred acres of land including the open pit and huge mounds of trap rock. The talc operation consisted of one full-time shift and a small office staff, about fifteen or twenty people, but the company planned to triple production, and increase regular shifts to three. MARMORA - Employees of Marmora's talc mine operation say they are in shock over the impending closure of the operation. Canadian Talc Mine operations in Marmora and Madoc are set to close Aug. 27, resulting in 50 job losses within the two communities: 27 in Marmora and 23 in Madoc. Union chairman and millwright Dave Anderson has been employed at the Marmora milling operation, which grinds raw talc mined north of Madoc into the finished product, for more than seven years. "I was flabbergasted," he said of coming to work June 23 and being given 60 days notice. "One day we're running smoothly, the next day we're closing up." Anderson said the pay scale - $22 to $26 an hour on average - will be hard to match for the workers seeking employment elsewhere. The closure is a softer blow for Anderson, who said retirement for him is right around the corner. Sherritt International, the company overseeing the Madoc mining operation and the company's offices and treatment facility in Marmora, cited financial difficulties as the reason for the closure. Marmora Reeve Terry Clemens described the closure as "difficult. "We've gone through more difficult closures in our history, but this isn't to be taken lightly, and for Centre Hastings, our neighbour, this is difficult too," said Clemens during Tuesday's council meeting. "There's a human factor to this. I know some of these people and it's a tragedy in their life." Clemens said he spoke to a company representative in Toronto who told him the company has been experiencing revenue losses for the past five years and "it was just not feasible to continue the operations." Clemens said council wishes employees from both Marmora and Madoc the best, adding he hopes they'll be able to stay in the community and find "gainful employment" locally. Economic development officer Typhany Choinard said she believes the community - which she described as "strong and vibrant" - can rise above the closure. "I think all of the communities have struggled with businesses closing in these economic times," she said. "The closure is unfortunate for our community, but small town communities are resilient and opportunities continually present themselves." Choinard said economic development can play a role in helping unemployed people who are looking for "entrepreneurial opportunities." "I would encourage anyone interested in starting their own business to contact our office to find out what support is available to them." For employees like Wayne Rogers, a maintenance mechanic at the Marmora location, the sudden notice that he will lose his job was a shock, but he said it may also be the push he needs to pursue a better career. "Everyone is going to be upset about losing their job. It's stressful at first, sure, but life goes on," he said. "This will probably just push me to do something else." The operation - which was first established as a mine in 1896 - was acquired by Sherritt International in 2007 as part of the assets of former owner Dynatec which had bought into Highwood Resources Ltd. in the late 1990s. Sherritt is a resource-based company that produces nickel, cobalt, thermal coal, oil, gas and electricity and has combined assets of close to $9 billion. MISTAKES CAN HAPPEN! Picture printed upside-down! "How's your brakes and what safety features are incorporated into the stopping of the vehicle? He replied, "The brakes are electrical and mechanical- a double safety feature on the truck". Another feature of the braking system was a lever for dry or wet roads which will take 50% of the pull off the front wheels and helps eliminate sliding or fishtailing as the trucks go down into the pit. The driver's seat which was of the bucket variety and very comfortablewas power operated up or down. Other features were power steering, the fuel tank which holds 250 Canadian gallons and a 990 horsepower caterpillar model D348-12 Diesel, 4 stroke turbo charged motor and G.E. Generator No. G.E. 603 and two G.E. - 772 K5 series motorized rear wheels. In other words the truck is diesel-electric. The electric motors on the wheels are governed and therefore once the vehicle reaches approximately 20 m.p.h. the electric wheel's motor governors take effect and also help brake the truck. The cab is insulated to ensure that the noise level in the operator’s seat will not exceed 85 decibels. There is a warning light on the dash when the box is raised, seat belts. mirrors, windshield washers, central lubrication system fully automatic with dual line, auxiliary steering in case of power steering failure and brake cooler. Jim Chard wrote: " The closure of the mine coincided with the shut down of the American steel industry, when America began importing the iron-steel based manufactured goods (vehicles by the millions), and the steel, from foreign nations. The iron at the bottom of the pit could have continued to be mined using the same underground methods as is done in Sweden today. The ore was there!" Watch the videos by "Adventure 360"